Warning: This screensaver does not work on macOS 10.14 Mojave. Currently it is not known whether tightened security prevents us from getting the picture of the desktop behind the screensaver window and we find a way to adapt. This screensaver shows a dimmed image of your desktop. So you can password protect your Mac while still seeing what is running. You can control transparency and update frequency using the Options panel. Transparent is localized for German and English. Double click the screensaver. 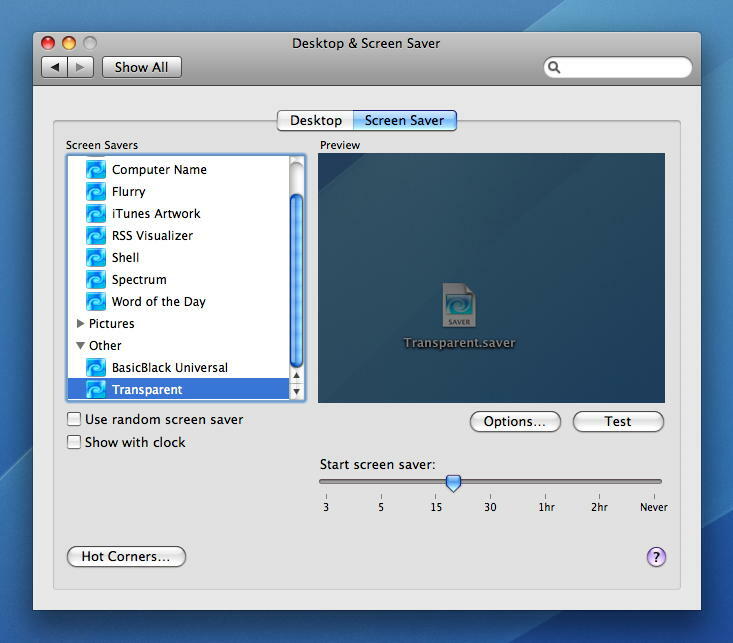 The system preferences application will launch and install the screensaver for you. If you have an existing one, you will be asked whether it should be replaced. Fixed an issue for retina resolutions. Fixed a memory leak which showed with recent Mac OS X versions. Requires Mac OS X 10.5 or 10.6. Slow Macs need to use a lower update frequency to keep the fans quiet. 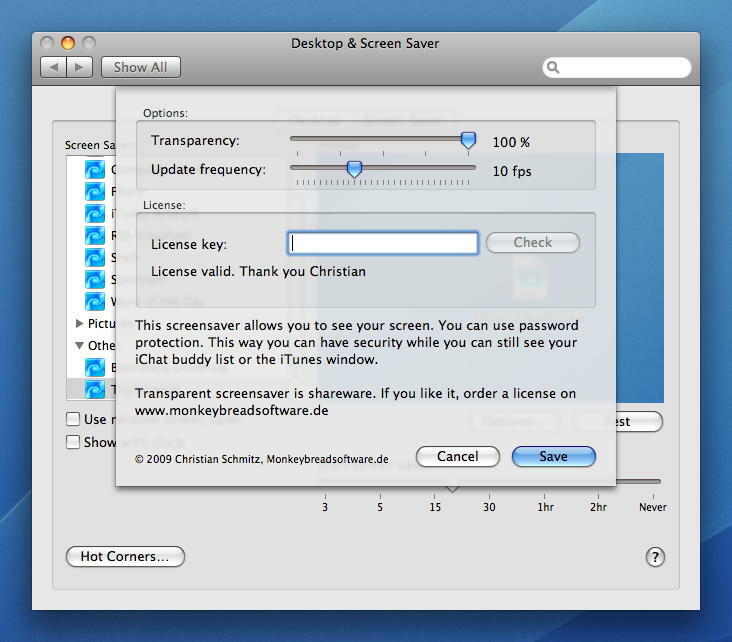 Transparent screensaver licenses are sold for 10 € or 15 USD over Paypal, Share-It, cash or invoice with wired bank transfer. If you want to send a letter with cash or you need an invoice, please send us an email. A license is required if you use it regulary. You can test the screensaver for 30 days before you need a license (without a license, the screensaver displays only a black screen). Licenses are per user with up to three computers per user. Organizations can ask for discounts if purchased for a lot of users. Visit the Share-It Online Store. License keys are delivered per email within 2 work days.